Thanks everybody for participating in the Tenkara Story contest. Enjoy! The stories are listed below in the order received. I caught my first fish fly-fishing using a telescopic carbon pole in a small mountain stream in France (no reel, just rod, line and fly). It's so long ago I don't even remember what kind of fish I caught or fly I used. Soon after I bought my first fly-rod, reel, line etc. I instantly became an almost fly-fish only angler and still use that hand-made rod 30 years later and fish small streams mostly. As soon as I found out about Tenkara I recalled my first fly-fishing experience and I bought a Tenkara rod and I am looking forward to our trout season start on April 1st here in the Netherlands. I happen to live close to the only stream in our country with a good trout population. In fact excellent due to the reintroduction program by our club. 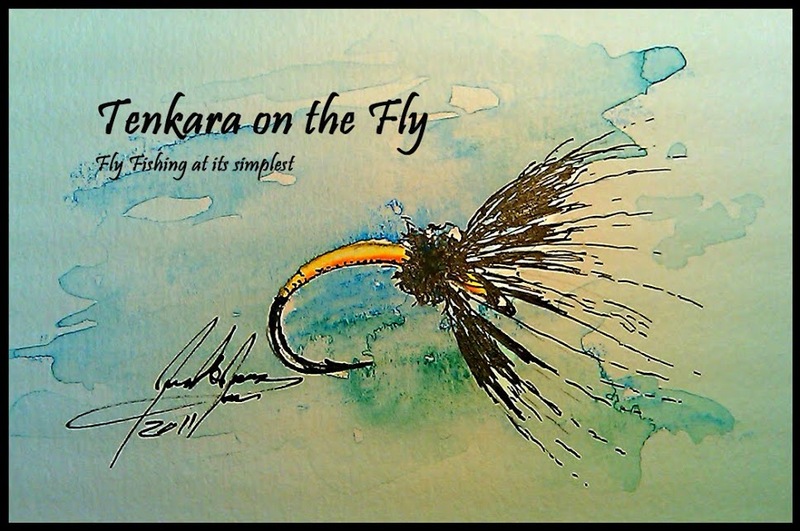 I am glad I got introduced to the Tenkara-style of fly-fishing and I am anxious to see if Tenkara is effective in my neck of the woods. So I fish the Gunpowder River in Maryland and for the past several years I've fished with a western fly rod, caught some trout here and there but very sporadic. The river is a world class cold water fishery with 17 miles of year round catch and release fishing. It attracts many anglers and gets fished hard. And the fish, mostly native wild brown trout and a few stocked rainbows are very educated. Recently I've seen in magazines these ads for a "new" "old" way of fishing called Tenkara. So I did some research, and with the attraction to the promise of simplicity and my own frustration in dealing with countless amounts of western fly fishing equipment. I purchased a 13' Amago rod, and haven't looked back since. I love the connection of one's self to the historical aspect of ancient angling techniques. The simplicity of the equipment dealing only with a rod, a line and a fly, focusing more on the rhythm of nature around you. Reading the water and essentially fishing rather than switching equipment or setting up for your next cast. The almost spiritual aspect of fishing that I believe Tenkara and only Tenkara truly captures when hooking and landing a fish. Feeling that powerful hard strike that makes you skip a heartbeat and tightens your hand around the rod handle. Feeling every majestic movement of the fish that electrifies your rod tip and surges down within your palm. The true "one with the fish" feeling. And being able to land the fish quickly without compromising the fishes strength, in turn achieving the ultimate goal of respecting and preserving ones passion of fishing. To sustain the species for future generations of enjoyment. Another thing that attracted me to Tenkara was the “bang for your buck” aspect of the sport. Let’s face it you can spend every paycheck till the day you die on upgrading your western fly fishing equipment. And for me just starting out in life, struggling to make ends meat and not being able to afford the next level of upgraded western fly fishing equipment to match my growing skill and deceiving more educated trout. Tenkara was the answer to that. Finding an amazingly priced rod and in comparison very cheap accessories that will last you the rest of your life in your pursuit of fishing. And finally the best quality in my opinion that Tenkara offers like no other method of fly fishing is that in the concept of deception. With the extension of rod length and the benefit of the ability to be able to keep the line completely off the water with only the fly on the surface, deceives even the weariest of speculate trout. For me an unsuspected saving grace to the timid, educated fishery that I face. And I have been catching trout left and right ever since. For me Tenkara was the answer and to anyone willing to give it a try it will change your life and might be an unexpected answer to another’s individual predicament as well. To fish painted unlike any other. That are the keystone to a heavy creel. I yearn to be closer to the ground. Of the fish sends shock waves down my arm. Forest green spotted blue, red and yellow. At the sunfish bending his Lightening McQueen rod. Today, I am closer to the water. That is all I ever want to be. For over two decades I had been an on-again, off-again recreational fisher, bouncing between spinning tackle, fly rod, casting gear, and even cane pole. For the last several years, I had favored a 10-foot, telescoping crappie pole with the line tied directly to the tip. It was inexpensive and simple, and it caught sunnies and bass out of the little lake in the center of my central New Jersey town. The only thing I felt was missing, was the elegance and versatility of casting a fly to a waiting trout in a secluded river or stream. Also during that time, I made it a point to seek out fly fishing opportunities while traveling, usually hiring a guide for half-a-day or the full day. I'd fly fish headwaters in the Green Mountains for a day during my family's annual summer vacations to Stowe, Vermont. I traveled early to a conference in Northwest Arkansas, just so I could fly fish the tail waters of the White River. I looked for every opportunity to fly fish on every trip I took. Using a guide helped make the trip productive, and I didn't have to invest a lot of money and time in selecting and purchasing gear. This helped to satisfy my Brothers Maclean wannabe childhood fantasies, a sense I couldn't get fishing my crappie pole on an acre-sized, downtown lake. It was about a year-and-a-half ago that I first learned about Tenkara while planning a backpacking trip. I had searched for "backpack fly fishing," and immediately found Tenkara. It was on Jason Klass's old blog. I ordered a 12-foot Iwana from TenkaraUSA. I was hooked. I have almost exclusively fished Tenkara ever sense. I brought my Tenkara rod backpacking in Shenandoah and to a hammock camping festival in Pennsylvania; I even carried it on a flight to Denver for a conference in order to fish a day in Rock Mountain National Park. Last summer, it came to Stowe with me and I introduced the guide, whom I had fished with on past trips, to the elegant simplicity of Tenkara. That's my Tenkara story, and I'm sticking with it (Tenkara that is). I do remember my first introduction to Tenkara. Came across a picture of a guy casting a rod to a small creek from a meadow while researching fly fishing. Where is the freakin reel I thought... Contacted him and he mentioned that it was a Tenkara rod, then somewhat explained the concept. Didn’t think much of it since it did not fit “fly fishing” in the definition here in America. After years of being self employed my wife and I have been blessed with great kids and grand kids and have been fortunate in our business so in the last few years we have both taken up hobbies. Hers is running, mine is fishing once again. We both have always loved traveling, camping, canoeing, most anything to do with nature. So we planned a trip to Colorado. Spent months practicing “fly fishing” with some good gear. Put it to decent use. Caught some fish, but always in the back of my mind were the comments about Tenkara since I was always trying to fish away from the regular “spots”. Caught more trees than fish for sure. Then all the stripping, mending, walking through trees and brush, it seemed like a lot of trouble. Determined and persistent I am and this is my rediscovered semi retirement hobby so I carry on. After this trip, and a search for used Tenkara rods a man named Owl had an Iwana rod, used once, so I bought it. Took it on my next trip with my “regular” fly rod. On a whim, decided to use it in a part of the river we were fishing. First cast with a dry fly-strike-catch!!! WOW!!! It was a Friday night in June of 2011, I was fishing Oil Creek in Northwest Pa. It's a place called Miller Farm in Oil Creek State Park. It was once teaming with oilmen ferrying oil to Petroleum Center. Now only fauna, flora, and trout...lots of trout. The daylight was vanishing and the other western fly fisherman were on the bridge over looking the stream as I the last man standing began to pic trout from the film like a fat a man at a buffet, one after another. Literally every other cast, all done by sound. As I was caught up in moment that is when I realized I was being watched by all on the bridge. As i came off the water and walked up to them with a 20" rod and no real they were in disbelief. I spent the next twenty minutes with all our hat lamps on discussing and explaining Tenkara. As trout season approaches here it will be interesting to see who made the leap to Tenkara, this leap year. So, I was just sitting there, mid- winter. Cold, clear day, just after the new year. It had snowed here in Denver the night before, nothing big for here, just three inches. Sipping on a grande, non- fat, no whip, 2 pump mocha, as usual, surfing on Starbuck's free WIFI. For a 61 year old, I do love my IPAD. One of my sections on Zite is Fly Fishing. That day, I was thinking about what flies I needed to get started in making. Rivers around here are so finicky, I knew I had to get going on some 26 to 22 size midges. Boring.... Pupae, larvae, effective as ever in the winter. Everyplace. Not much new in the patterns I was seeing. WAIT! What's this? An article about Tenkara? Never hear of it. Japanese style? Thought they used nets. :-( hmmm, reminds me of fishing for perch off the dock with a long bamboo rod with what must have been a twenty pound test filament line and a worm on a hook. Aged 8. Well, that was fun, I thought, as I remembered being out there with Dad, and sis. Ha! She just WOULD NOT stick her own worm on that hook! Gimme a break. But, that was a fun time. OK, I'll read the article and the links, sez I to myself. I'll send this to myself with Evernote and continue tonight. Got home, watched Dr Ishi and tried to understand Saka. Looked simple. I kinda liked that, at least for a change. Flies are too big though, at least for Colorado. Last summer, I remember being out on the Blue. Water was still a bit high, but I was out there mid current. Remembered that back eddy that I just couldn't quite hold a fly in without the main current dragging my line and fly on downstream. I thought then, if I only had a longer rod, maybe I could keep the line off the current. Hmmm, these Tenkara rods are 10 to 16 feet long. That woulda done it. Said "guess I'll sleep on it." Intriguing. Kinda fitful sleeping that night. Next day, figuring I had to try it, I went on-line & ordered a rod - Kasugo -4509, 6:4 action, along with a six-pack of flies to use as a guide in making some more. Well last week was my turn. After 3 or 4 days in the high 60s here in Colorado. Went out on March 15th, the Ides of March, what could be better? Chose the Colorado River, right below Parshall (you Colorado fisherfolks know where). Water was a low as I'd ever seen it, 31 degrees when we got there, water was 40. Did warm up about 15 degrees. (air), but the water had ice floating in it throughout the day.... Did see a few fish rising - always do in that spot. I need that custom Horse Hair Tenkara Line (12 or 13 ft please), the spools, & the 6 flies! Please pick me!!!!!!! Every night my husband comes home from work and jumps on his computer and carouses fly fishing blogs. One weekend we were driving in Park City near his favorite home waters. He was telling me a story about this "new" Japanese style of fly fishing he read about. Tenkara. He said it was cool because it was affordable and was steeped in the rich Japanese culture of fly fishing. Being that he is Vietnamese, I knew that having an asian connection resonated with him. So I did my usual head nodding and "uh huhs" half way listening and half way thinking of my own thoughts. Because when he talks fly fishing he can go on for hours. He often speaks about fly fishing in the future with our daughter. So after our weekend, when I was home alone, 7 months pregnant with our first child, I wanted to do something nice for my husband to show him that I appreciated all that he is doing for our family. I knew his birthday was around the corner and I wanted to get him the gift of Tenkara but didn't want to wait to give it to him. Everyday he checked the hatching reports so that he can plan his fishing excursions for the weekend. So as I am sitting there conjuring up this great plan to get him a new Japanese fly fishing rod, I couldn't remember what it was called because I was only half listening to him. So I started searching the internet to find the name of this Japanese fly fishing, knowing I would recognize the name when I saw it. When I found the Tenkara USA website, as someone who doesn't fly fish, I wasn't sure what to get him. Because the prices were so affordable I decided we could outfit him with an entire Tenkara starting kit. So I purchased a Yamame rod, each set of flies, tying stuff (I don't know what it's called), a net, and a line. When the big box arrived I tried putting each individual piece into a smaller box. I loved the fact that the flies came in those little glass vials with a cork. I knew then that this aesthetic would appeal to my husband perfectly. When he comes home the first thing he was going to do was go to his computer and start looking at fly fishing blogs. I placed all the individual boxes in places that he would have to pass through to get to his computer and a few around his computer. I couldn't fit the rod in a different box, so I put it in his chair where he would sit. And he did exactly what I knew he would do. He found a box and said "What's this?" He opened each box with the type of excitement I'm sure he had as a child. My husband loves fly fishing. My husband lives for Tenkara. Above our daughter's crib on the mantle my husband has placed the tiny glass vials each with a different Tenkara fly in a neat line, so as sleeps, she too will dream of Tenkara. I'm not all that old. I've had forty-one birthdays as of this writing. But time has left its mark on me; the thinning hair, the aches and pains...There are memories from my youth that are written on my brain, indelibly, like with some kind of mental Sharpie. Bold and permanent. As I've gotten older though it seems like new memories have become less so. New memories are like footprints in the rain filling with water, their contours becoming muzzy, until finally they are mostly indiscernible and filled with murky water. The memories of my youth seem, in contrast like footprints on the moon. Pristine. When I think about my journey to the foot of the mountains wherein my tenkara lies, it is hard to remember the more recent events that lead me to stand there. My oldest memories are gathered into a primordial ocean. That is the ocean from which I crawled on fins or flippers, the ocean in which I was formed, knit together from bits and pieces of memories. In contrast, my newest memories are only tiny streamlets – noisy, tumbling and jumbled and unimpressive compared to the ocean. I know most will evaporate before they complete their run to the sea. It is hard to recall what the streamlets whisper. So I can't say for sure where I learned of tenkara. It was, I think, from an internet advertisement on a fly fishing website. However it happened, a seed was planted, and finding fertile soil it grew. It took about six or seven months to sprout. That is about the time it took from hearing about this thing called tenkara to actually buying my first tenkara rod. Let's back up. A tale of a journey should start at the beginning. But where is the beginning? There are an infinite number of absolutely improbable things that happened (or didn't happen) to bring my existence about, stretching back through time to the creation of the universe. And each of these things are necessarily a part of the tenkara journey. How far back do you go? I'll pick out a few moments. My paternal grandfather, a first generation Italian-Serbian American joined the U.S. Army in 1942. He was 19. He was sent first to North Africa, then to Sicily and then landed at Anzio in Italy. He served as part of a chemical mortar unit and marched from Anzio to Rome, where he entered the city victorious and enjoyed some R&R (I've never heard specifics – but one can imagine that party). Anything can happen and often does. I often wonder over the idea that anybody survives to adulthood. But of course serving in the army in WWII was a particularly dangerous occupation. According to family lore my grandfather had two very close calls. I imagine these as moments where my existence stood in the balance. Once, the sweet temptation of the fruit of the date palm led him into the upper reaches of a tree. I never did find out if the dates were any good – but my grandfather always claimed that the tree saved his life. An artillery shell hit while he was in the tree, exploding in mayhem and death in the spot where he had been moments earlier. Another time, while sitting around with his buddies on the beach at Anzio a shell landed in the middle of their group – it did not explode. And so, either through dumb-luck or fate, here I am. Living the American Dream of postwar America, my grandfather got work in a Steel Mill, got married, bought a house, had two kids, took vacations in Florida, took up golf and continued the outdoor life of his father and uncles. Stowing a pack of howling beagles in the enormous trunk of some 1950's sedan they would head just out of town for a day of rabbit hunting. My father likes to tell me how the old guys would walk the train tracks while the young guys were assigned the same duty as the beagles, that is struggling through the brambles that lined the banks along the tracks kicking out rabbits. Later his Serbian grandmother would cook the rabbits up in spaghetti sauce. Deer hunting and trout fishing were done at the Camp up in the “mountains”. These are Pennsylvania mountains were talking about – the Alleghenies – and their resemblance to those rocky peaks of the west is passing at best. My grandfather was a salmon-egg and trout worms, opening weekend, early-season trout angler at most. It was an activity to do with the guys – it was not an obsession. Still, as far as I can tell he is the beginning of my trout fishing lineage. I sometimes like to imagine that my Italian ancestors were fishing with the tenkara-like style of Pesca Alla Valsesiana to trout in the Sesia valley of Italy, but in reality my grandfather's family is from Reggio Calabria. Reggio Calabria is down near the “toe” of the Italian boot and about as far away from the home of Pesca Alla Valsesiana as you can get in Italy. It is very unlikely that my Italian ancestors ever cast a fly for trout in Italy. I'm not sure that I remember my first trout. I remember the day before my first trout trip though. I remember standing on my grandfather's back porch. My enduring mental image of my grandfather is of him sitting on the glider on the back porch in the summer, bowl of sliced cantaloupe on his lap, and he's wearing an undershirt and boxers. This trip was probably springtime though, so he was probably wearing more than that summer outfit when he offered his fishing advice. He must have wanted to say something to mark the occasion of my trip. He was a very caring man, but sentiment was difficult for him to express. So he said to me. “Catching trout is not like catching sunfish.” I don't remember if he elucidated that remark or not. He probably meant it as a gentle warning against likely disappointment due to an unsuccessful first trout fishing trip. I don't recall if I caught fish on that trip or not. But my grandfather's words have stuck with me for 30 yrs. Eventually I did catch trout. My first trout memories are of slim wild brookies caught from the bottom of deep pools in a diminutive Pennsylvania mountain stream. It was the kind of stream that is defined by glacially deposited boulders of car and truck sized proportions. Each large bolder would be attended by a deep placid pool. Cast your salmon egg and split shot to the head of the pool let it ride into the depths and settle. Then...tap, tap, tug, splash and flip. I feel like I can recall each tiny trout. Eventually I graduated from jars of salmon eggs to little plastic cups of maggots. Maggots somehow seemed more refined. All of you fly fishers don't fool yourselves. The real “killer” bug is the maggot. Trout seem to really enjoy their maggots – they cannot resist them. From maggots I went to spinners. Then the leap to the fly rod. I went to Penn State University in State College Pennsylvania. One of the state's best wild trout streams, Spring Creek is within bicycling distance of the campus. Penn State offered the country's first fly fishing course for college credit (Phys-ed credit). I was not aware of that when I matriculated. I was not a fly fisherman at the time. I was a spin fisherman. The moment I decided that I wanted to become a fly fisher is perfectly clear to me. I was in the library's periodical section looking at copies of fishing magazines. There was an article in one about the limestone streams of Pennsylvania, Big Spring, The LeTort, Falling Spring. The pictures showed pastoral streams winding through fields with willows sweeping low along the banks. It talked about the fly fishing heritage of these streams and the innovators that fished along them, Charlie Fox, Vince Marinaro, Ed Shenk. They were fly fisherman – and clearly this was the only way to properly fish these streams. So it began. I got a Cortland 8' 5-wt GRF-1000 with a Cortland Crown II reel for my birthday – that was almost exactly 20 yrs ago. Of course I have upgraded a little over the years. I've never really been a gear junkie. I want to fish, and I want decent gear that works well, but always sort of enjoyed sticking with the less expensive gear. $800 fly rods than weigh next to nothing might be nice – but I'd rather spend that money on a trip to Colorado. The onslaught of high-end fly fishing gear in the past few years is a turn-off to me. Sometimes it seems like it's not about fishing – but only about having expensive gear. I realize some of the hypocrisy in that statement. After all I'm not fishing with the cheapest possible stuff. Another pet-peeve of mine is fly patterns. The number and type of patterns touted by fly fishing magazines and books has become paralyzingly large. The new fly angler must look at the array of patterns being thrown his way and be tempted to throw in the towel. After all if you don't have that size 22 BWO cripple with, CDC partially emerged wings and z-lon shuck, with just the right blend of synthetic UV and natural dubbing (in just the right shade) and tied on the proper emerger hook, then well – you can't hope to catch anything. Pack up your rod and go home. Half of the time when I read a fly recipe in a magazine I don't know what most of the materials are or where to get them. What happened to fur and feathers? My fly fishing had become progressively more complicated – and I had mistakenly thought that that meant it had become better. Keeping up with that world of fly fishing was difficult and tiring. So when tenkara came along it was like an answer to a question that I hadn't even fully articulated to myself yet. I was yearning for tenkara and I just didn't know it. Or more precisely I didn't know the name to put to it. Tenkara. To step out of the rat race of modern fly fishing's obsession with more and more and to reset the fly fishing clock, that is what caught me I think. I have to admit that I didn't know, at the time that I would be won over so completely. I thought tenkara would be just another way of fly fishing for me. I didn't realize that it would become the way of fly fishing for me. Tenkara takes me back to my humble origins. Tenkara takes me back to a sort of simple and wide-eyed innocence of my first trout fishing experiences. Back then, to catch those trout was amazing to me. And now to catch them on my tenkara gear is amazing to me. By taking away all of the extra layers of accumulated junk - tenkara has allowed the wonder of fly fishing to shine again for me. Corny? Maybe – but nonetheless true.